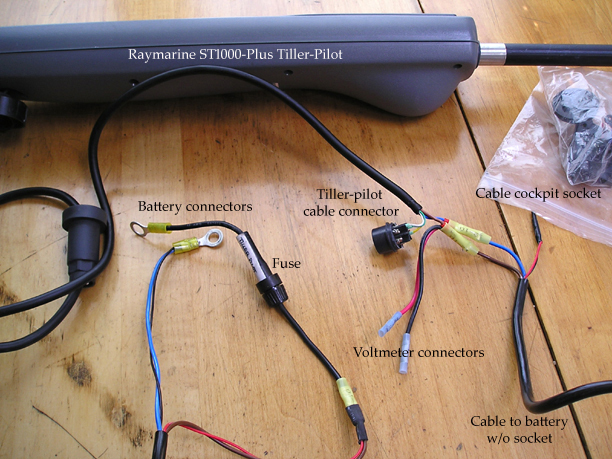 The relentless failure of my Raymarine ST1000-Plus Tiller-Pilot continues to baffle and confound me. Here's a history of my bad experience with it from the beginning and what I've done over the past months while struggling to make it work. The first new unit kept intermittently shutting itself off every few minutes. Finally I drove it up to Raymarine's service center in Nashua, NH where a technician, Lee Tang, took me back to his bench and disassembled the plug connector at the end of the unit's cable. He found the power and ground wires were not solidly connected with the tiny set screws inside the plug -- the power lead was actually floating loose inside! He soldered both wires to their plug connections, benchtested the unit, and pronounced it working. This made perfect sense to me. I put it back on the boat, took Chip Ahoy out, and again attempted to calibrate it. It still kept shutting itself off. The following day (a Friday, the last day I could reach Raymarine before departure on my extended Maine cruise the following Monday) I drove back up to Raymarine and demanded a new unit. Lee Tang took me back to his bench again and got me an entirely new unit. He made up a complete new cable (that includes the permanent socket mounted on the cockpit coaming and runs to the power supply). He even soldered the leads to a new socket plug, using two wires within the cable for each connection. (There are four wires, two for power and two for data if you are connecting to other Raymarine instruments). He told me that if I still have the problem it could be either in my original socket or in my wiring: replace both with his new cable/socket assembly. I left, again certain the problem was solved, or would be. The first thing I did upon departure on my cruise was attempt to calibrate the new unit -- and it performed the same stunt, shutting down on its own! So I dug out Lee's new cable/socket assembly, crimped a pair of alligator clips to the two paired power wires, and attached them to Battery One (the larger of the two, which I was using at that time to run everything). I ran the cable out the companionway across the cockpit and attached the new soldered socket directly to the new unit's plug. It worked for a while, but later in the day again began randomly shutting itself off. Further up the coast at my next port, I replaced the alligator clips with crimped on ring connectors and connected them directly to Battery One's posts. I also ran the new cable beneath the cockpit, fastened it in place, and mounted the new socket onto the cockpit coaming, replacing my original cable and socket. This too proved to be another waste of time that made no difference. Next I tried isolating the tiller-pilot entirely, switching over to Battery Two for everything else, dedicating Battery One to just the tiller-pilot alone. This too produced no improvement, no difference. I've noticed that the intermittent shutdowns seem to happen more frequently when the motor is running -- though even just under sail it happens regularly. I considered the possibility that the problem has something to do with the outboard, perhaps the alternator charging system. But with the battery switch set to Battery Two and the tiller-pilot alone using Battery One I'm baffled how this can be. With its dedicated power source -- its own fully-charged, isolated series 27 battery -- interference from the outboard or any other electrical connection can be ruled out. Besides, why does the tiller-pilot fail while strictly under sail, without the outboard running? Another observation: often if I just wait long enough after it shuts itself off, it turns itself back on, but off again after a while, then on again. Sometimes the power doesn't return on its own; I have to unplug then replug the cable to make it turn on again. On my first visit, Lee Tang found the two power wires loose in the unit's cable plug, the tiny set screws loose. He soldered the wires in place. The solution seemed obvious at the time, though it didn't solve the problem. When I checked these connections on the new unit's plug, I found the set screws very tight, the connections good. They must have had better quality control at their manufacturing site in Great Britain the day this one was assembled. Yesterday, at the direction of Lee the Raymarine technician, I eliminated both the plug and socket -- his latest theory of what's wrong -- and hardwired the unit directly to it's dedicated and fully-charged 12V battery (see photos above). Lee also wanted me to connect a voltmeter to the power wires. He suspected power fluctuations or loss through the plug and socket connection or the wiring harness. He expected the voltmeter to demonstrate this, to show no voltage when the tiller-pilot shut itself off. This too made utterly no difference. The voltmeter registered a constant 13-plus volts throughout the afternoon without fail even while the unit kept shutting itself off and sometimes on again. This proves -- once and for all -- that the problem is in the Raymarine unit(s). After Lee soldered the loose wires in the original unit's plug it made no difference. 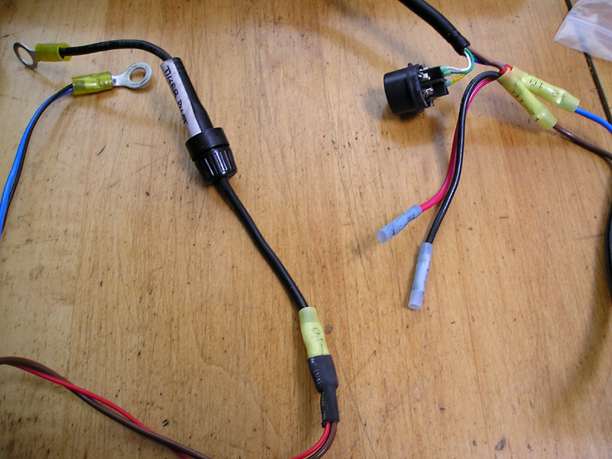 The new wiring harness Lee built made no difference. The new socket and plug he provided made no difference. The replacement tiller-pilot performed no differently. Lee Tang has been very good about returning my calls and e-mails, and he has done everything professionally, step by step, trying to isolate the problem. When I demanded a new unit he provided it and went above and beyond by building a new cable assembly for it. But nothing he or I have done has made any difference -- both of the new tiller-pilots have this same critical problem, both have always kept shutting themselves off and continue to. These units are useless, even dangerous if I was foolish enough to rely on them, and always have been from the beginning. The problem is Raymarine's -- the headaches, frustrations, costs and risks have been mine. I removed the entire unit and cable, leaving only a hole in the cockpit coaming where the socket used to be; a piece of duct tape now covers that hole. On Tuesday I will drive up to the Raymarine customer support center in Nashua, NH -- for the third time. Nothing they've done up there has been of any consequence. I've wasted trip after trip. I couldn't use the tiller-pilot, trust it, on my extended cruise up the coast of Maine singlehanded -- the very purpose for which I spent $450 and a day of my labor to install it. If I had it to do over again, knowing what I know now I'd instead purchase a Simrad TP10 Tiller Autopilot, for about $100 less. If Raymarine doesn't resolve this situation once and for all this time -- and now -- I shall next seek restitution through the courts. I did not spend almost a week's pay for a piece of equipment that has never worked reliably, that I've had to struggle so hard trying to resolve, that's wasted so much of my time, money, spoiled my plans and put my safety and that of my boat at risk. Sailing season 2004 is almost at its end -- and not once since I installed the Raymarine tiller-pilot over Memorial Day weekend in May has it worked properly. It is now September and it still is not working. All I have to show for it is a new hole in the cockpit covered with duct tape. I would have been better off just throwing my $450 away and saving myself from an entire season of grief and aggravation. I still might be better off just tossing this worthless piece of useless ballast overboard. But I won't. I want satisfaction and will get it. One way or the other. I want Raymarine to send a technician to my boat and stay there until I'm assured that their tiller-pilot is finally working properly, consistently and reliably. Nothing less will do. There's no alternative now, but the courts. Three strikes and they're out. I spoke with both Raymarine technician Lee Tang and supervisor Mike Ryan the first thing this morning, updating them on my actions and their results -- or more accurately lack thereof. They invited me to bring the ST1000 back up for another check-up, but they too were baffled with the problem. I was offered another -- the third now -- new unit, but instead told them I'd prefer not to drive again for over three hours round-trip just to keep banging my head against the wall. I suggested that, if I'm going to make that drive again that I wanted at least another model and preferred to pick up an ST2000 and give that a shot. Mike agreed to upgrade my ST1000 to a ST2000 for an additional $150. That was a start. After checking prices on the Internet, I called back and told him the ST2000 sells for about $100 more than the ST1000 on a number of retail websites -- that the last thing I expected from him was that kind of a "deal" after all my headaches and aggravation over the past three months. He offered to sell it to me for $100; I told him we'd negotiate when I got up there -- and advised him to visit this page before I arrived. Back up at Raymarine's Nashua, NH service center, Mike met me and took me back to Lee's bench. Lee put my tiller-pilot on his test bench and it ran perfectly. He took apart the unit, removed the circuit board and checked the connections and the board. The connections were good as was the board. He let it run for about 20 minutes, during which it didn't shut down. He explained that it was a different environment there than on a boat -- no motion or movement. Mike banged and shook it but still it remained on. The problem, once again, could not be replicated on the bench. I then asked them to check the assembly dates of the two units, thinking they could perhaps be part of a bad batch. The second new tiller-pilot was assembled five months after the first. I haggled with Mike over the price -- insisting that upgrading my flawed unit at no cost was the very least they could and should do. He offered to give me a straight refund for my bad unit: I argued that perhaps this would have been acceptable when the first unit failed -- but not any more, not after all I've gone through. In the end, my choice was either a flat refund or a $100 upgrade to the ST2000. Since I've already cut the holes in my boat and drilled the tiller to mount the unit and pin, and the ST2000 uses the same holes and hardware, ultimately I decided to spend the additional $100 for the upgrade and keep my fingers crossed that I'm not tossing more good money after lots of bad. Lee stepped in and got Mike to agree to refund my entire cost if this new ST2000 also has the same problem, and advised me to just hook it up and see if it works before I permanently install and mount the wiring harness and its hardware. If I encounter the same problem, Lee advised, I should just box it back up and return it for my refund -- that the problem resides somewhere aboard my boat. If that's the situation, he recommended that I try the Simrad auto-tiller or another brand. Over next weekend I'll bring the ST2000 out to Chip Ahoy and wire it up, see if it works. If the problem persists with this one -- now the third -- I intend to call in the Boatworks electronics people down at the boatyard, an authorized Raymarine service provider, and have them take a look at everything. Nobody can explain it, but it sure does seem like the problem is at my boat's end and not in the Raymarine units. Today I mounted the new ST2000 in its cockpit coaming socket then ran a new cable from its plug across the cockpit, through the companionway, and directly to Battery One. It beeped and turned on, a good start. I let it run in standby mode for almost three hours and it never shut off, so I then mounted the new plug socket and routed and secured the cable beneath the deck. It's routed the same as my original cable was, which I removed: from the back of the tiller-pilot plug socket on the starboard side coaming aft to and across the inner transom, then forward along the port side beneath the seat to the battery. I replaced my original cable (insulated 14-gauge two-wire) with insulated 12-gauge two-wire, as the owner's handbook has a table showing that the "minimum cable size acceptable for the power supply" for up to 13 feet is 14-gauge and "Correct power cable size is critical for correct autopilot operation. If in doubt, use a heavier gauge cable than specified." My cable route was and is 16 feet -- though that wasn't the problem: Raymarine technician Lee Tang previously built a new 10-foot cable/socket assembly for me that I ran directly across the cockpit and through the companionway, and later routed beneath the cockpit's starboard side, directly to the battery, and that didn't work either. But as long as I was starting all over new I decided on more overkill. I also soldered the two wires to the plug socket instead of depending on the tiny set screws. It ran in standby mode perfectly for an additional hour-and-a-half. Tomorrow I'll take Chip Ahoy out and attempt to calibrate the tiller-pilot. If I succeed then I'll use it sailing for the afternoon and see what happens. My hopes are up -- that's bad, because they've been up before only to be dashed. Three months later, success at last! The third Raymarine tiller-pilot I've installed since the end of May -- an upgrade to their ST2000 from two ST1000s -- seems to work perfectly at long last! Today I motored almost a mile out of my mooring area and it was still running. Once outside, I did the two 360° circles in calibration mode, and it didn't shut off -- it calibrated to the end for the first time. Then I used it to point and keep me into the wind as I hoisted sails, and it actually did. Next I used it for a couple hours to keep me on course under sail, and it did that all afternoon. Then I used it to drop sail and guide me back under motor to my mooring, and it worked perfectly. Next, I'll wire the fuse back inline. When I'm sure that works I'll disconnect the power leads from Battery One and connect them back to the buss panels, one at a time until I'm sure the tiller-pilot continues to work. See -- that didn't take much, right? Hey, what's a whole wasted summer if in the end a piece of new equipment finally works as advertised! My conclusion: Two faulty ST1000 units all along. And then the ST2000 died . . .